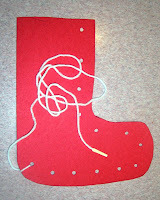 We continue our fun with glitter this week by "sewing" a Christmas stocking. For this craft I have it very well prepared for my three-year-old class, mostly because we don't have lots of time. This really can be adapted so that older children have many more steps. I believe that if you have the time children can do most of these steps themselves. 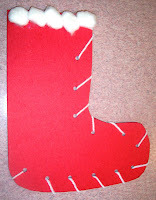 They made need guidance during hole-punch time, and they might need help to tie the yarn. 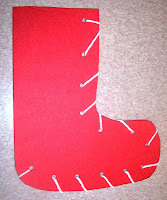 Fold the construction paper in half and draw a stocking shape on it. 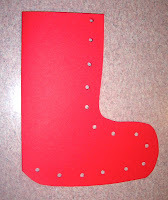 The straight edge of the stocking is along the fold. The children can then cut the shape out. Now punch holes around all the edges except on the fold. Tie any color yarn to one end hole. 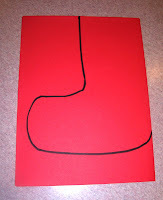 I make a "needle" out of the other end by putting some masking tape around it. Allow the children to sew the two pieces together. When they get to the other end I tie off the yarn. The sewing can be a little difficult. This is a very beneficial eye-hand coordination activity. 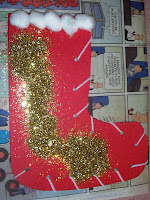 After the stocking is sewn together glue goes on the top edge then covered in cotton. Now here is the best part. 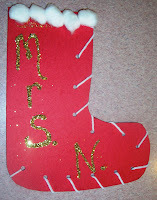 I write the names in Elmer's glue, then let them pick out a color glitter they like. We pour the glitter over the glue, then Ta-Da, shake off the glitter and a beautiful name is left. You could use glitter glue for writing the name, but the look of wonderment on the children's faces when they see their name appear is priceless. 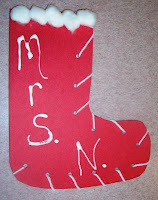 For my class, I already have the stocking cut out, punched, and the yarn tied to one end. I give them to the children to lace and add cotton and names. 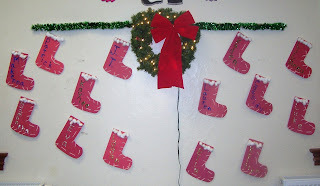 I then hang the stockings on the wall and secretly put a candy cane in them on the last day. These are really pretty and also functional. The book I was going to read today is called, "Where Do You Sleep, Little One? ", by Patricia Hooper, illustrated by John Winch. 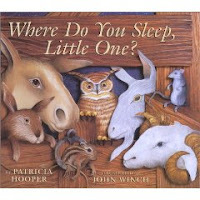 This book goes through a big list of animals and asks them where they sleep. It ends in the stable telling the Little Child to go to sleep. The meaning of the book is very subtle, one may not even catch that it is a Christmas story. It has rhyming text which is very engaging and keeps the children interested. The illustrations in this story are gorgeous. The illustrator was able to add a 3D effect to many of them. The only reason I didn't read this book, is that I switched activities for the day and went with another story. I could only find the book on Amazon. I think it's a bit expensive, but it will give you an idea. Thanks so much for the tag and award. I hope maplekisses gets to read this. I, for some reason, am having trouble leaving comments on her post. I'm probably missing something. Thanks again though, I really appreciate it. I tried to post a comment, but misspelled a word, I don't know how to fix it. It should say "now" at the end instead of "not."